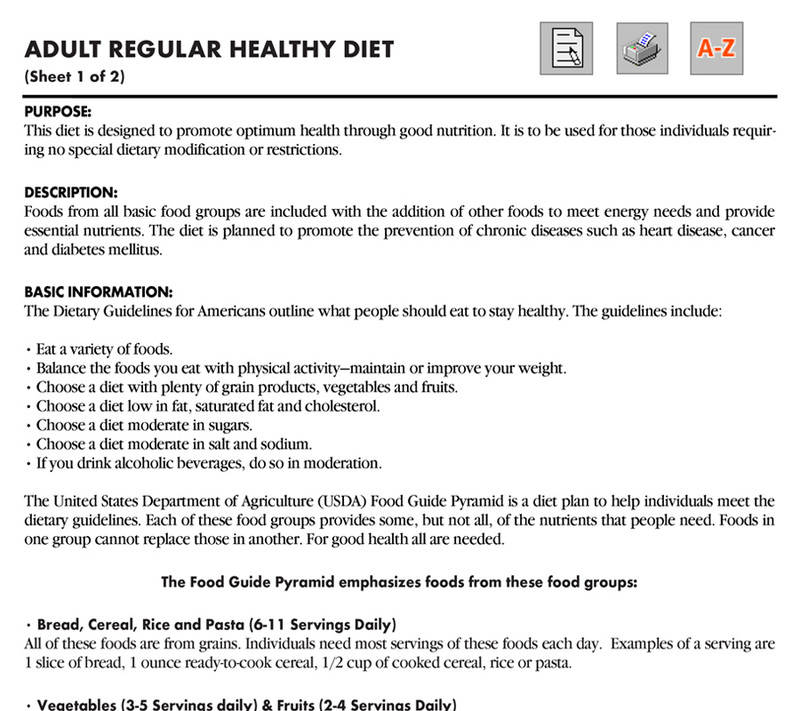 This diet is designed to promote optimum health through good nutrition. 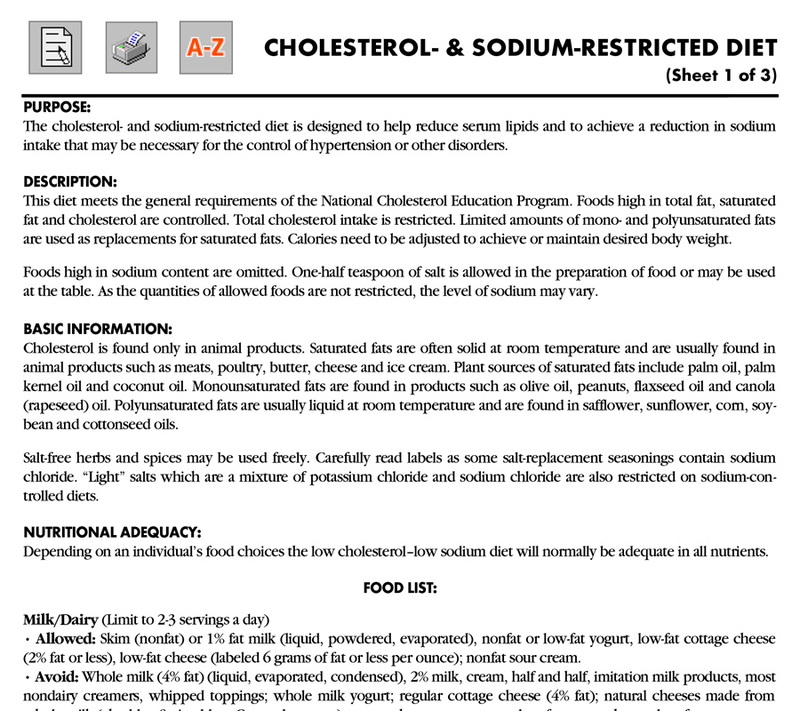 It is to be used for those individuals requiring no special dietary modification or restrictions. 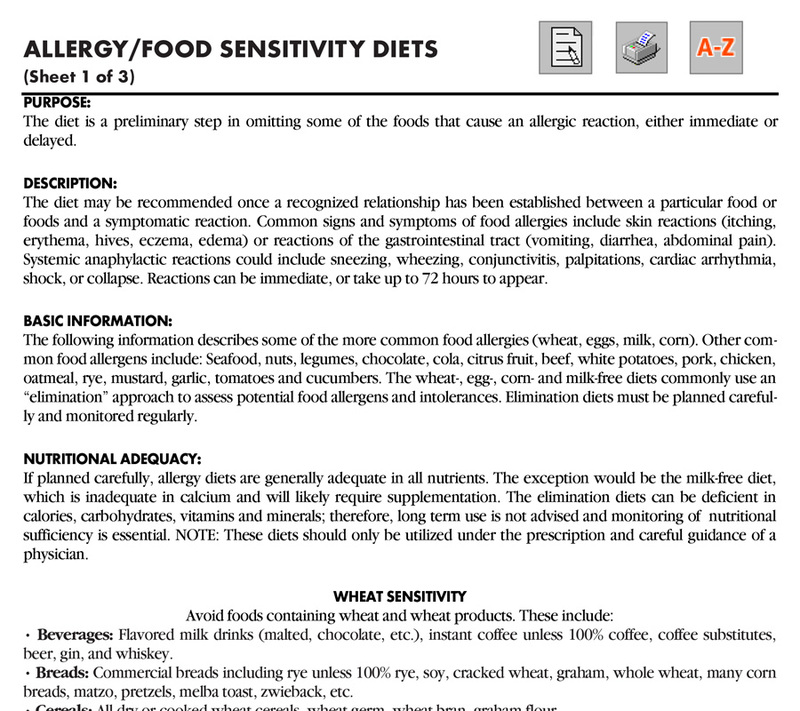 The diet is a preliminary step in omitting some of the foods that cause an allergic reaction, either immediate or delayed. 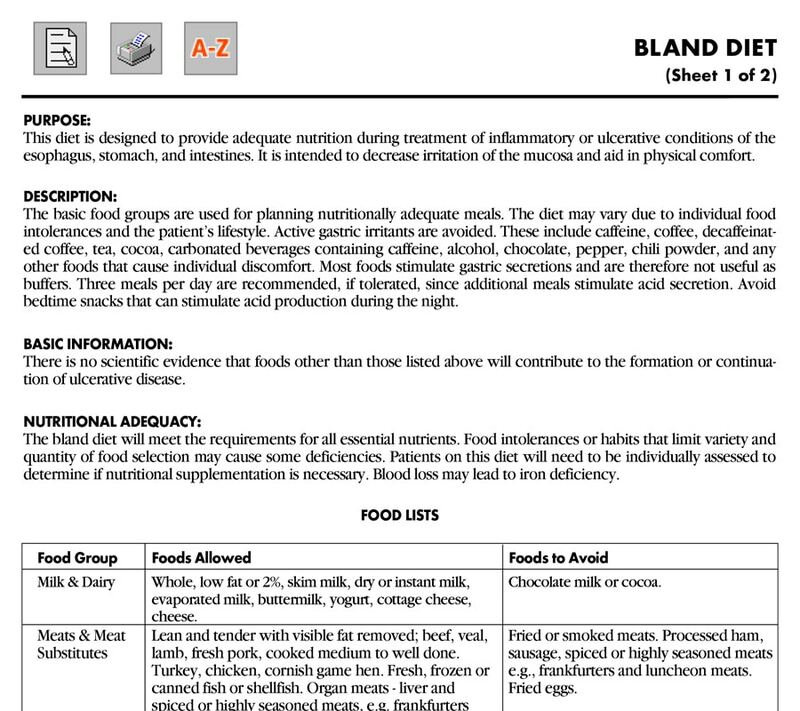 This diet is designed to provide adequate nutrition during treatment of inflammatory conditions of the digestive tract. It is intended to decrease irritation and aid in physical comfort. 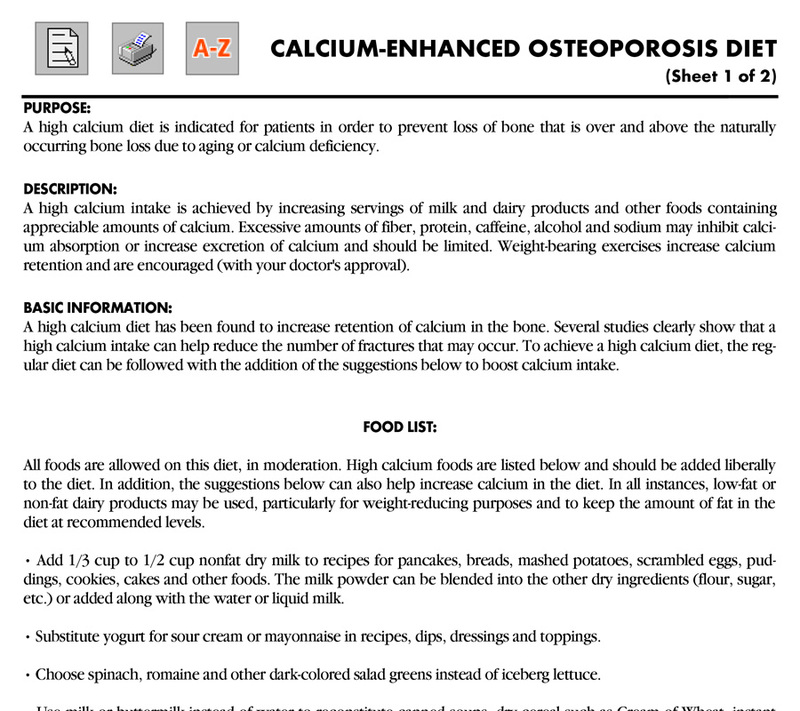 A high calcium diet is indicated for patients in order to prevent loss of bone that is over and above the naturally occurring bone loss due to aging or calcium deficiency. The cholesterol- and sodium-restricted diet is designed to help reduce serum lipids and to achieve a reduction in sodium intake that may be necessary for the control of hypertension or other disorders. 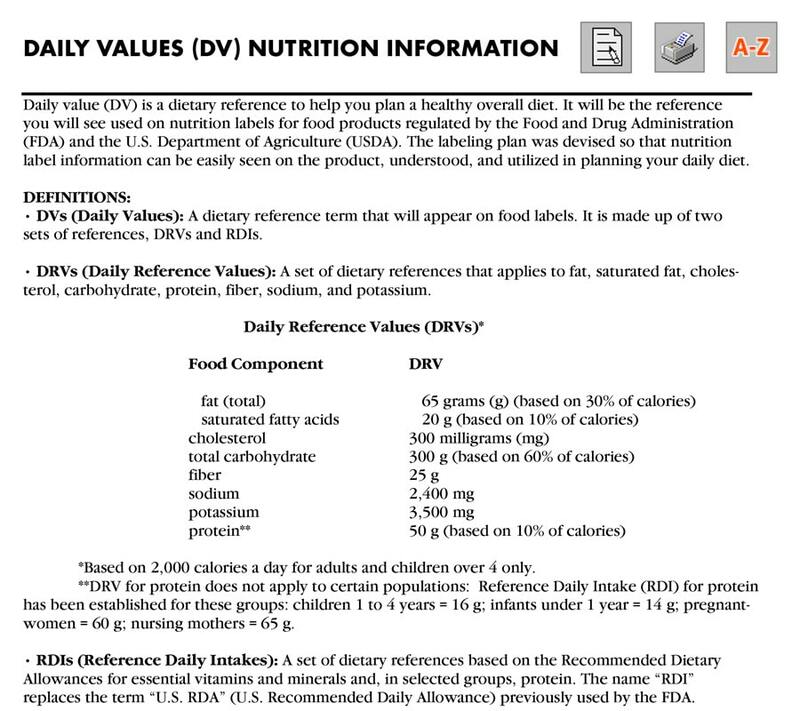 Daily value (DV) is a dietary reference to help you plan a healthy overall diet. 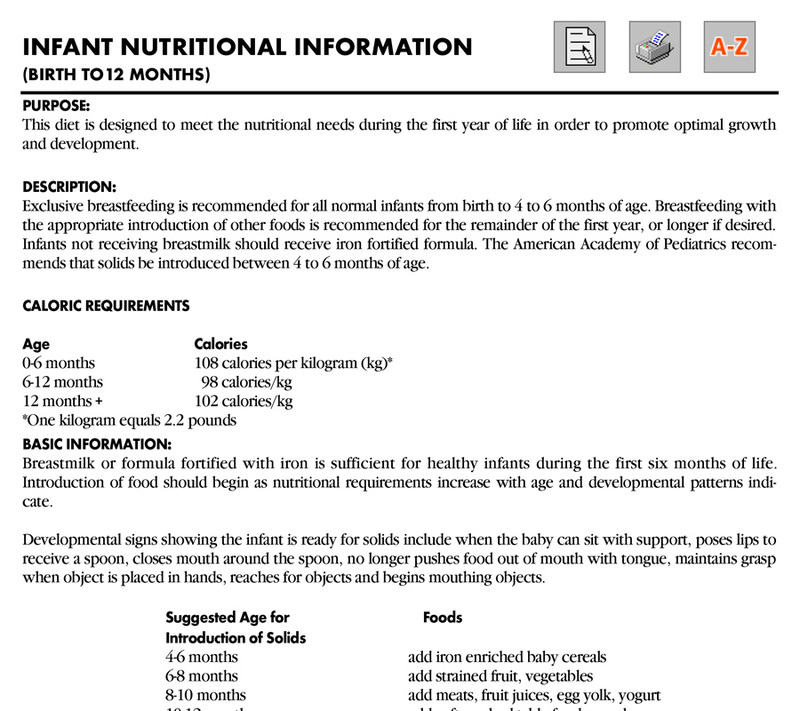 The labeling plan was devised so that nutrition label information can be easily seen and utilized in planning your daily diet. The low fat/low cholesterol diets are designed to reduce serum lipids for the treatment and prevention of coronary heart disease (CHD). 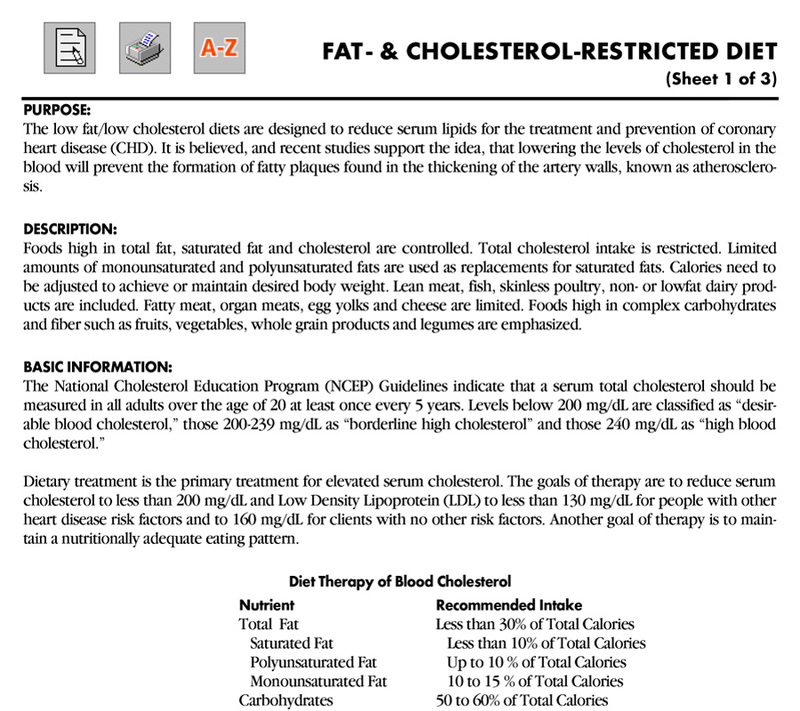 Lowering levels of cholesterol in the blood will prevent the formation of fatty plaques. This diet is designed to provide foods containing indigestible fiber as a part of preventive and/or therapeutic nutrition. 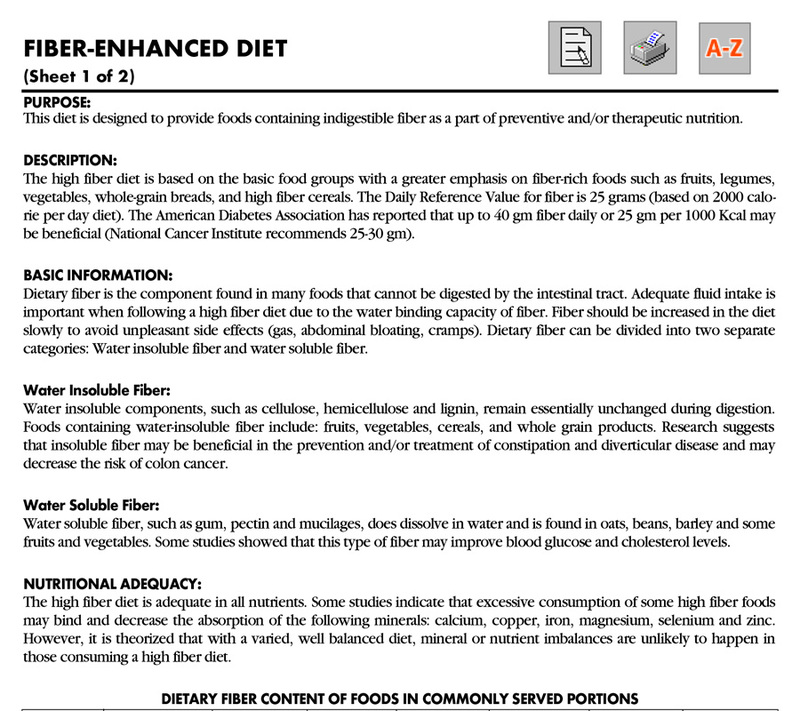 The high fiber diet is based on the basic food groups with a greater emphasis on fiber-rich foods. 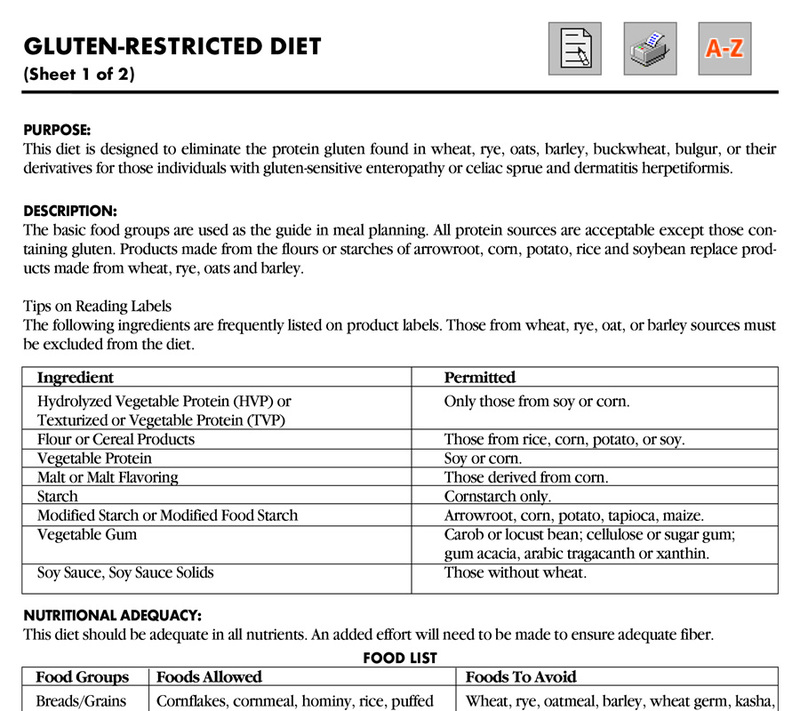 This diet is designed to eliminate the protein gluten for those individuals with gluten-sensitive enteropathy or celiac sprue and dermatitis herpetiformis. This diet is designed to meet the nutritional needs during the first year of life in order to promote optimal growth and development. 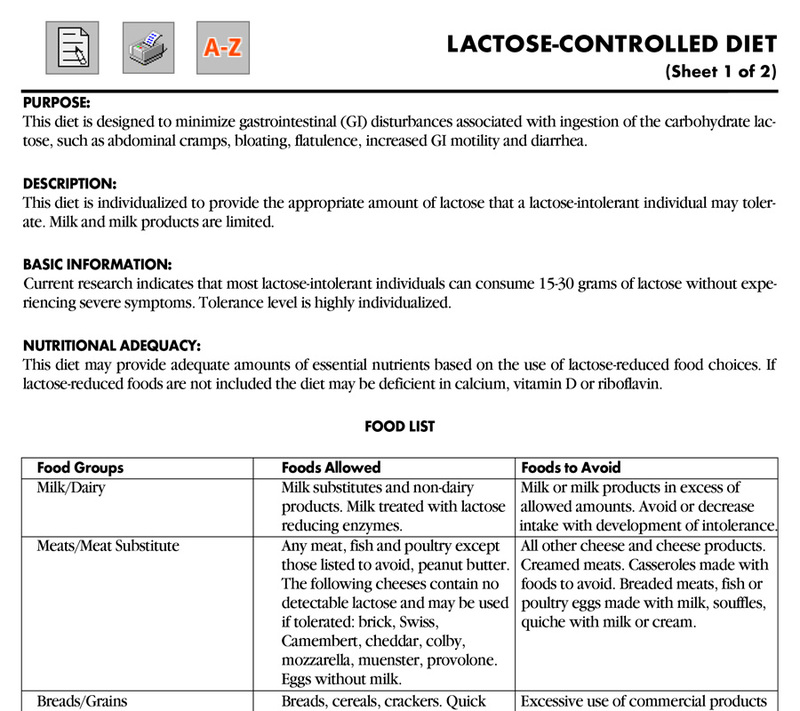 This diet is designed to minimize gastrointestinal (GI) disturbances associated with ingestion of the carbohydrate lactose, such as abdominal cramps, bloating, and flatulence. This diet is often used to minimize digestion within the gastrointestinal tract. Fluid and energy are provided in a form to minimize digestion. 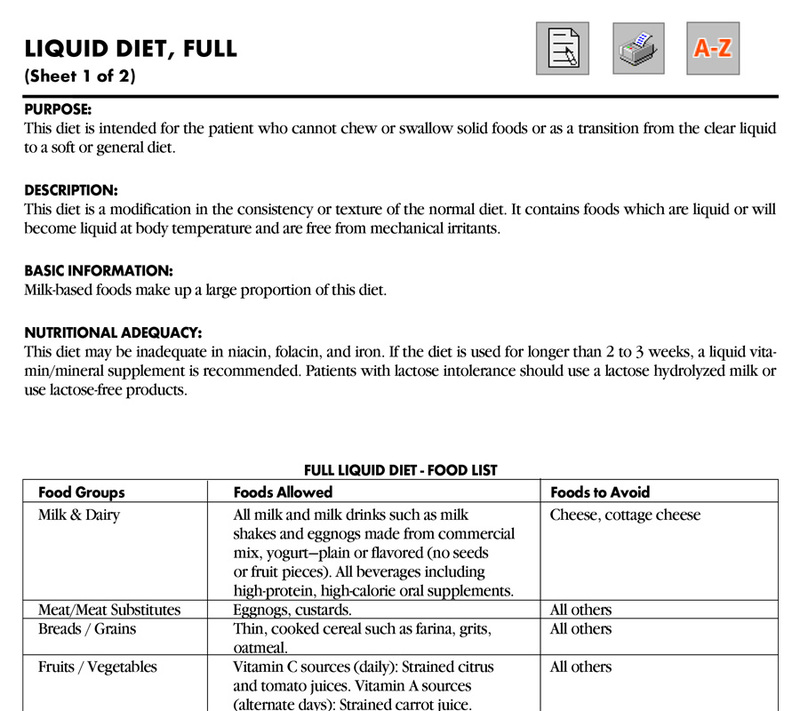 This diet is intended for the patient who cannot chew or swallow solid foods or as a transition from the clear liquid to a soft or general diet. 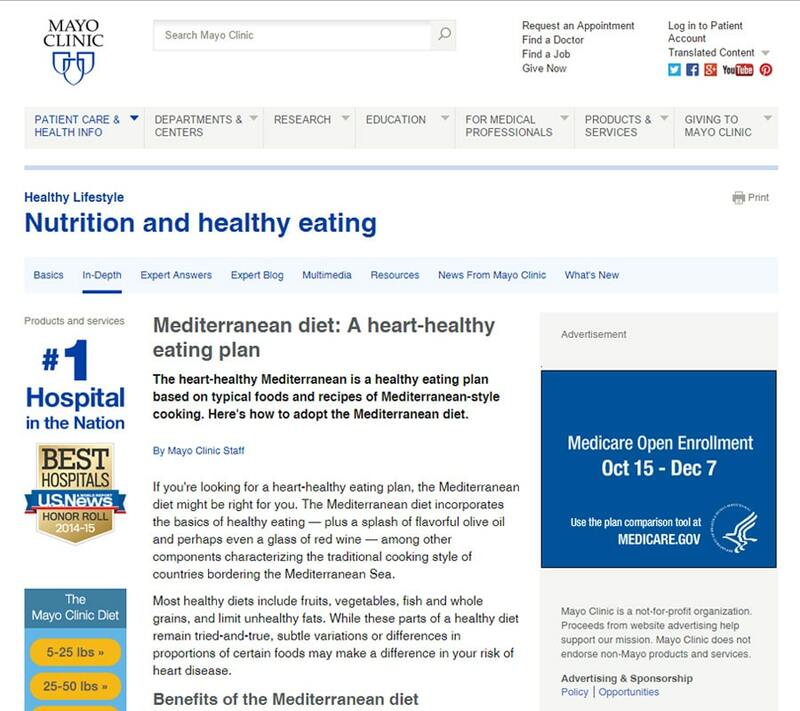 The Mediterranean diet incorporates the basics of healthy eating — plus a splash of flavorful olive oil— among other components characterizing the traditional cooking style of countries bordering the Mediterranean Sea. 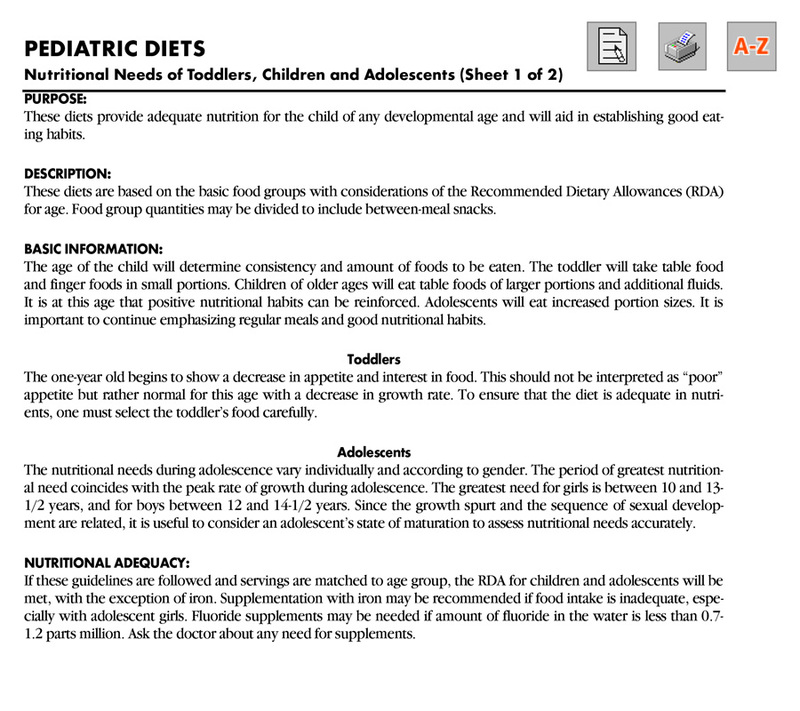 These diets provide adequate nutrition for the child of any developmental age and will aid in establishing good eating habits. 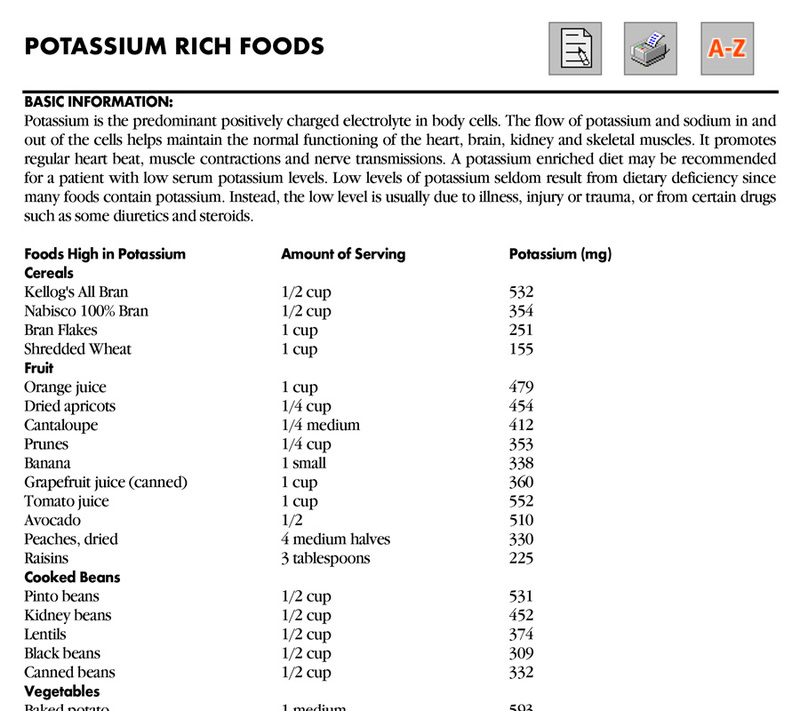 A potassium enriched diet may be recommended for a patient with low serum potassium levels. Low levels of potassium seldom result from dietary deficiency since many foods contain potassium. 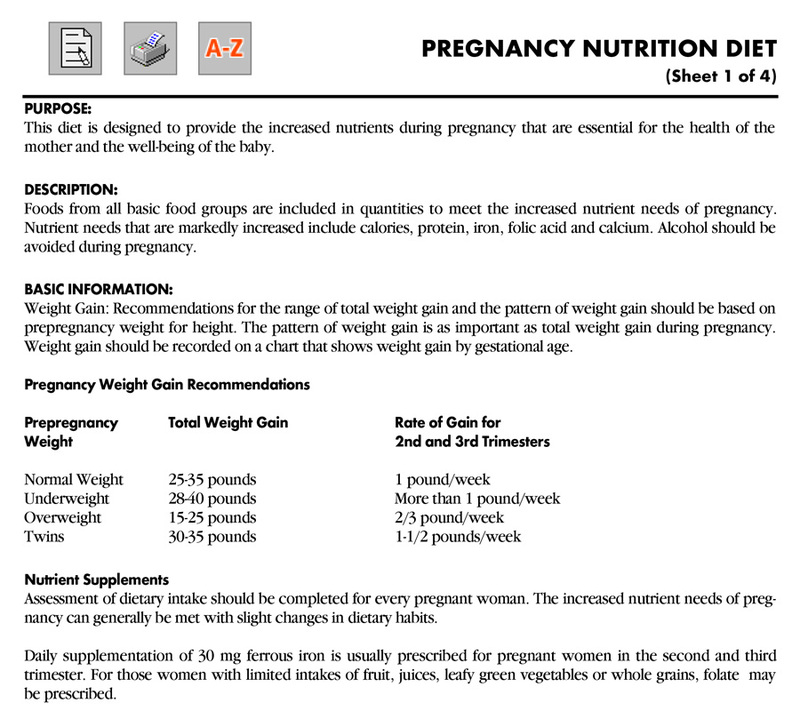 This diet is designed to provide the increased nutrients during pregnancy that are essential for the health of the mother and the well-being of the baby. 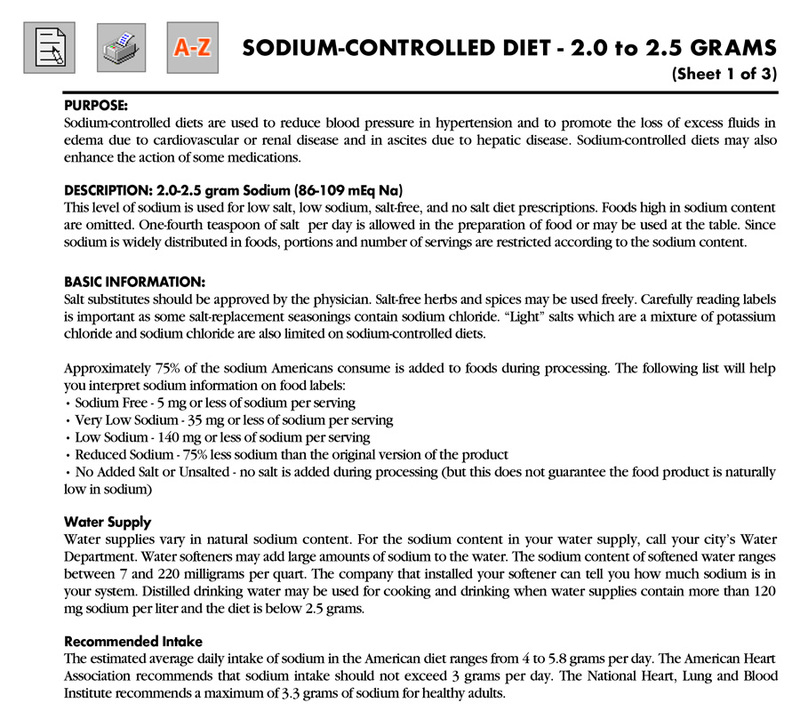 Sodium-controlled diets are used to reduce blood pressure in hypertension and to promote the loss of excess fluids in edema due to cardiovascular or renal disease and in ascites due to hepatic disease. 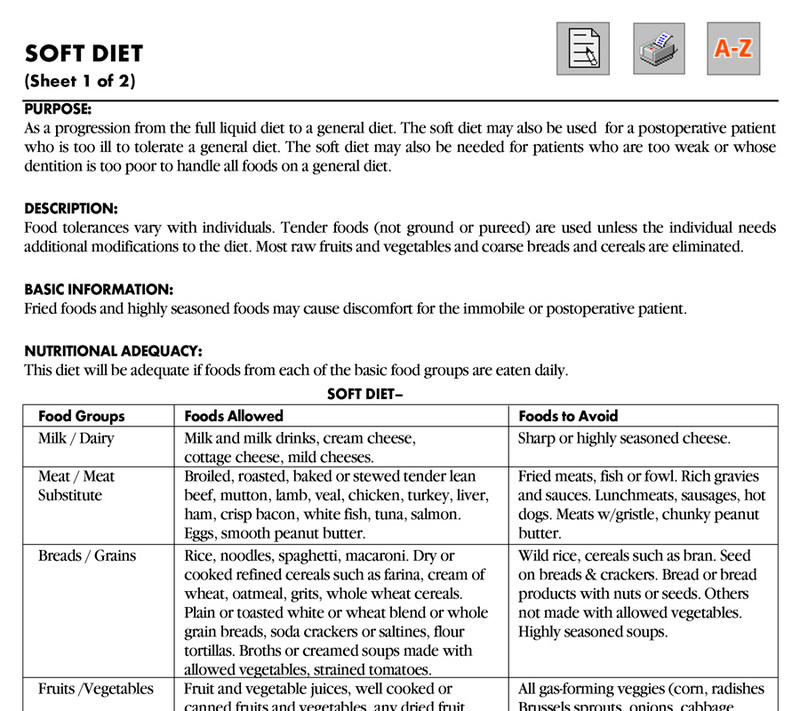 The soft diet may also be used for a postoperative patient who is too ill to tolerate a general diet. The soft diet may also be needed for patients who are too weak or whose dentition is too poor to handle all foods on a general diet. 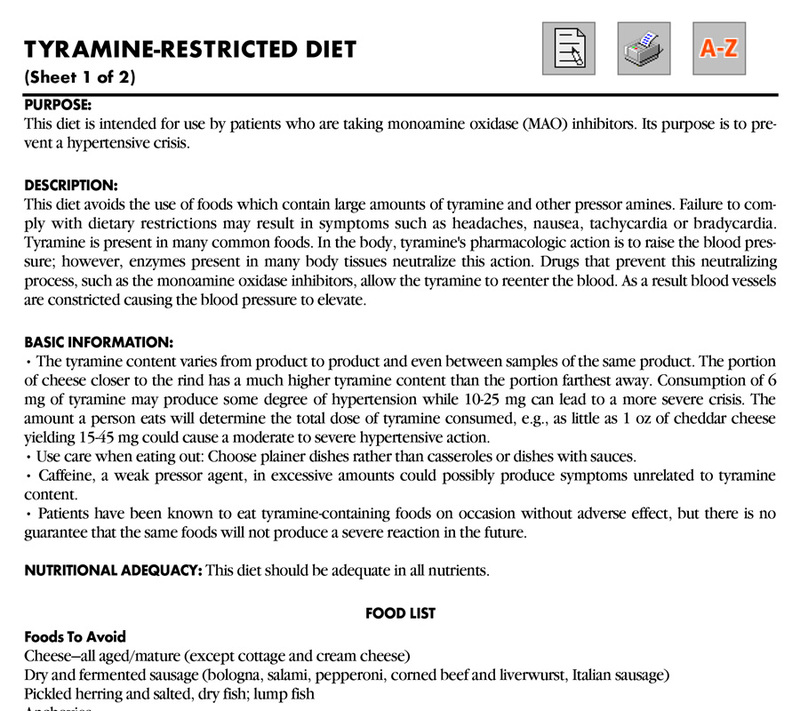 This diet is intended for use by patients who are taking monoamine oxidase (MAO) inhibitors. Its purpose is to pre-vent a hypertensive crisis. 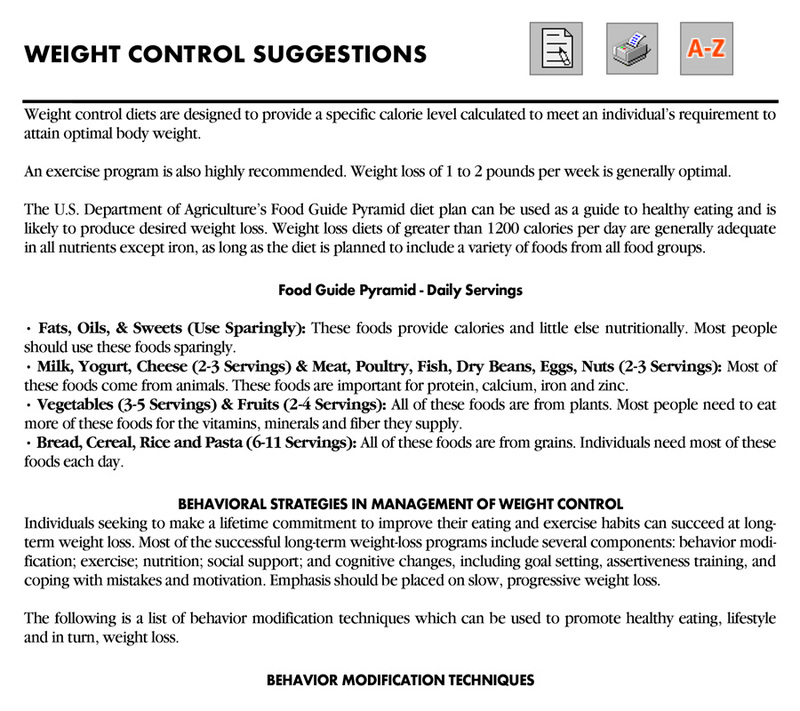 Weight control diets are designed to provide a specific calorie level calculated to meet an individual’s requirement to attain optimal body weight. 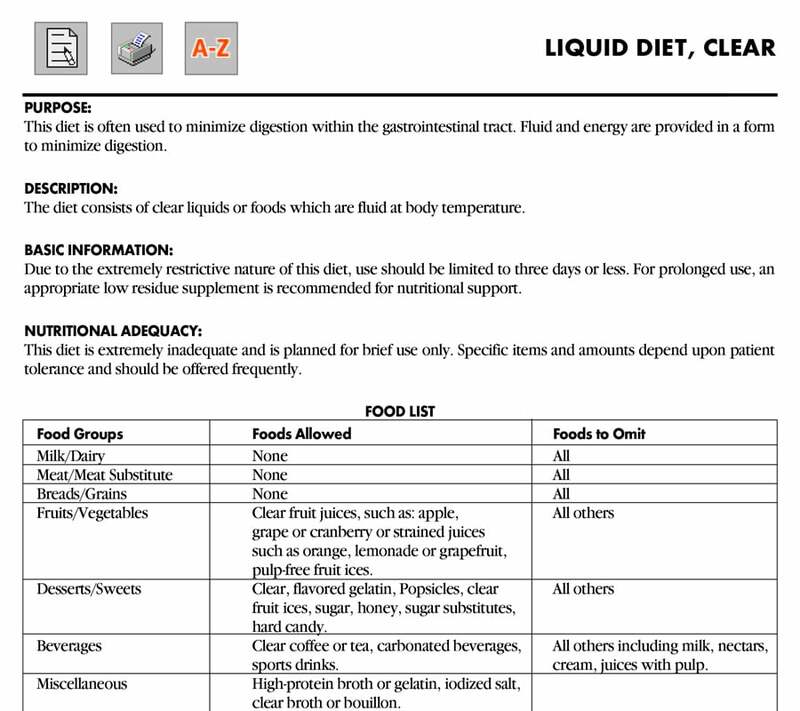 This is a simple “exchange list” diet for individuals who want to lose weight. 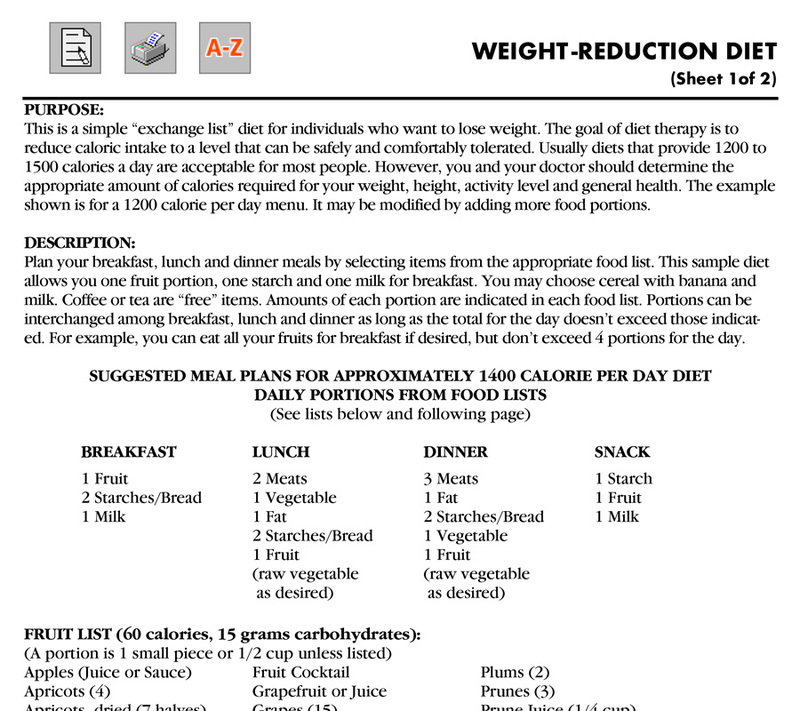 The goal of diet therapy is to reduce caloric intake to a level that can be safely and comfortably tolerated.